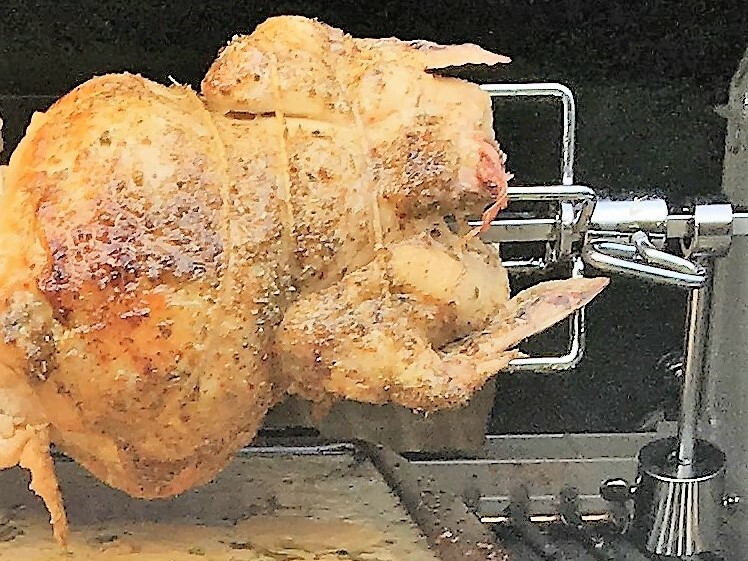 Is it better to roast a chicken on a Gas Grill, a Pellet Grill or a Kamado Style Charcoal Grill? We love food! We do not claim to be chefs, but, we prefer our own food to what is found in 95% of the restaurants. That is just the way we are. We also happen to have friends who enjoy food just as much as we do. So, having 3 grills in the backyard, which of the 3 is the best? Gas, Pellet or charcoal? We decided to cook the very same food on the very same day on each of the three grills. We chose to roast 3 whole chickens, one on each grill. We soaked all 3 chickens for 12 hours in water with salt and sugar. Then, we rubbed them with a greek spices mix; we also took the fat from a Toulouse Sausage pack and placed that fat between the chicken skin and the meat. We mounted two chickens on beer can style racks. One of them was going on the Big Green Egg and the other one on the Louisiana Grill LG900. 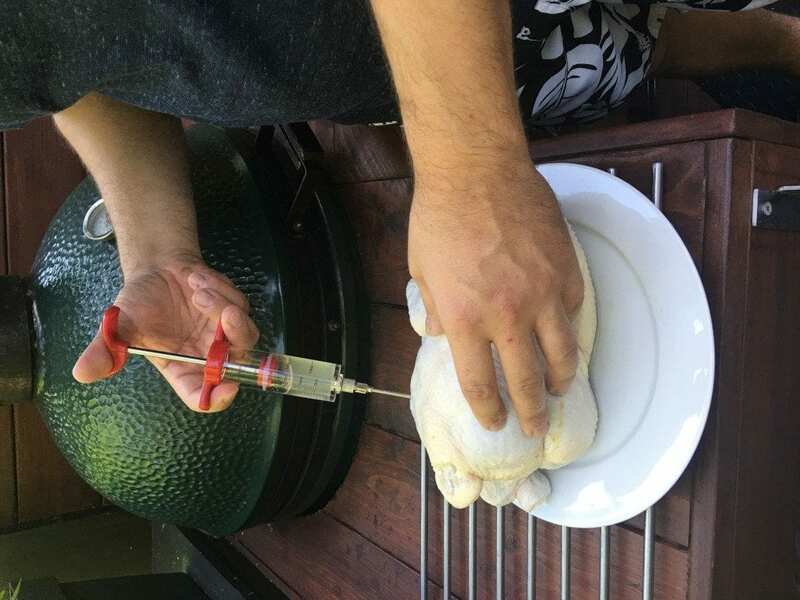 The third chicken got on the Napoleon Rotisserie Kit. All three grills were set at 400F. 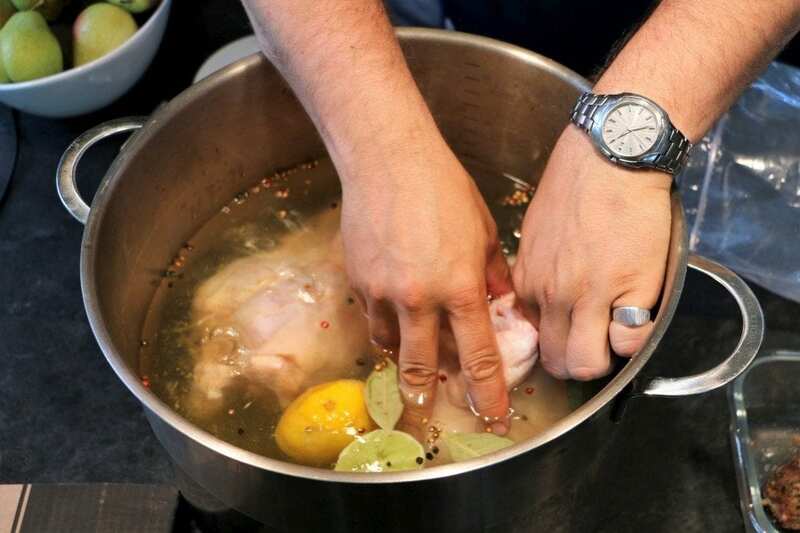 This might sound a little high for chicken, but we felt we wanted to ensure the skin would get a nice crispy effect. We monitored the internal temperature of the chickens, to make sure we would get them out as soon as they are ready. Needless to say, our backyard had the best smell in the area! The Big Green Egg always produces a beautiful smoke that creates a feeling of vacation inside. Especially if vacation means camping trips and food done over a camp fire! 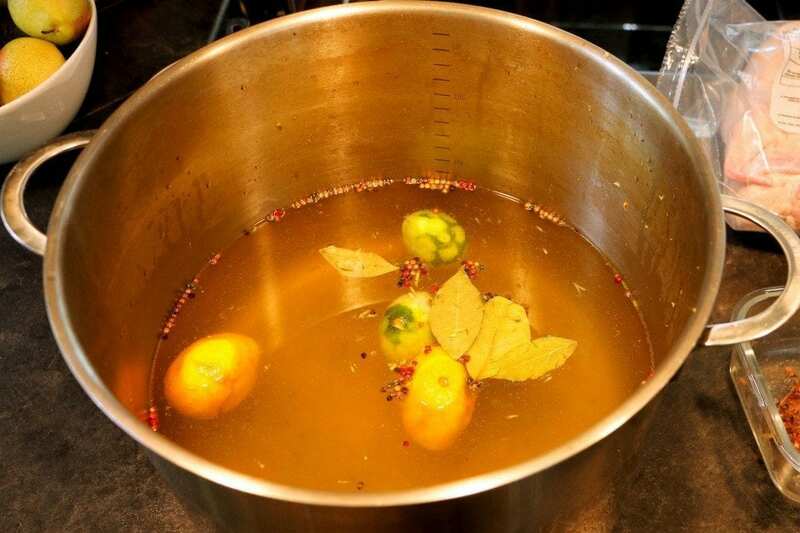 The Louisiana Grill produces a beautiful scent as well. The smokiness of apple wood being burnt offers a sweeter scent, with hints of caramel. Very unique! It actually was the nicest of all 3 grills to our opinion. The Napoleon Ambiance Grill did produce a more ‘foody’ smell, but it was unable to compete with the other two. Well, we must admit one thing. We started this test with a biased viewpoint. We truly thought the Big Green Egg would simply floor the other grills! First, the delivery time. Although all 3 grills were set at the very same temperature, The Big Green Egg delivered our chicken faster than the other two grills. 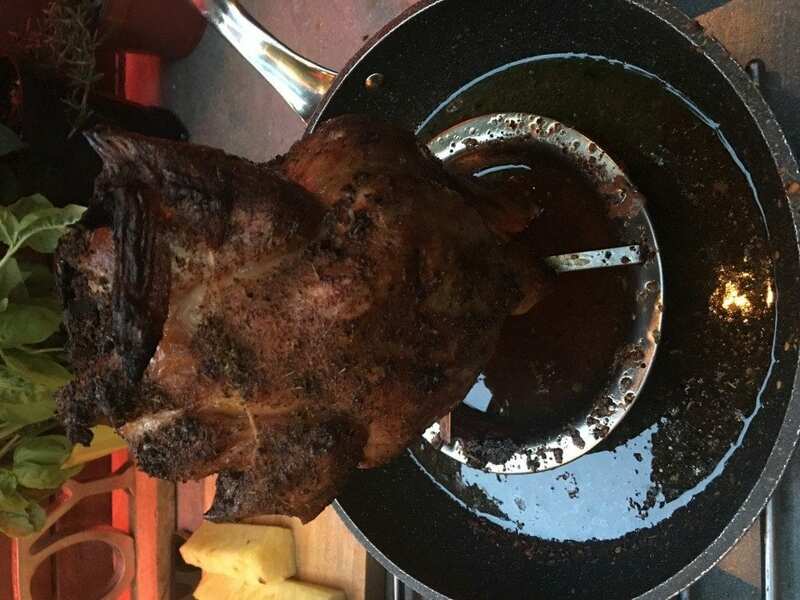 The chicken on the Big Green Egg got cooked 30 minutes prior to the Louisiana Grill LG900. 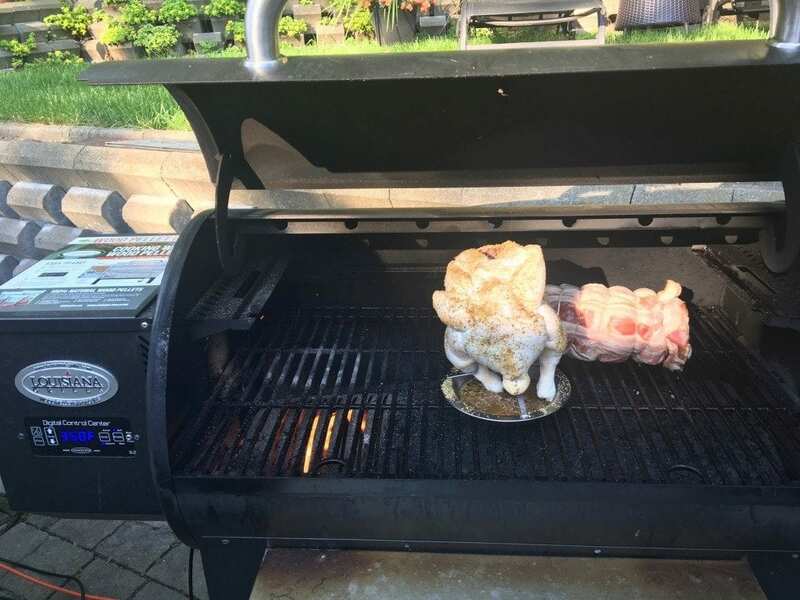 Then, the LG900 delivered its chicken 30 minutes ahead of the Napoleon Ambiance Grill on Rotisserie. We were a little shocked to see how much time difference there was between all three grills. We were not expecting it. We were amazed at how beautiful the chicken cooked on the Louisiana Grill was. It definitely was the nicest looking one of the three. The color was perfect and even all around the chicken. If you want to ever impress on looks, the Louisiana Grill delivered a stunning look. The Big Green Egg, although we were using the diffuser plate, still left some nice charred marks on the skin. Nothing wrong with those, especially if you like eating the skin itself, it adds flavor!. 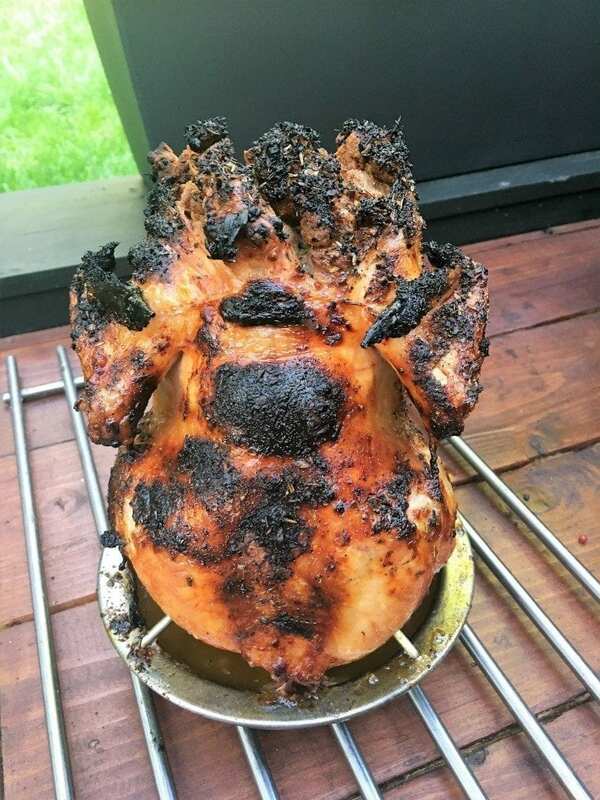 The Napoleon Ambiance Grill, on the rotisserie, did a fair job on the skin, but the ‘ends’ of the chicken were not grilled as much as the rest of the chicken. Here too, we got a little surprise. The smoky flavors on both the Louisiana Grill and the Big Green Egg are outstanding. We were expecting the Big Green Egg to be the clear winner here, but quite honestly, we could not tell the difference in the taste between the two. Both were equally as good. The surprise came from the Napoleon Ambiance Grill. The chicken taste was clearly different. It was the only chicken that actually got the ‘spice flavor’ transferred to the meat. While the other two chickens did get the same spice rub, the Napoleon roasted chicken was the only one who truly transferred the spices to the meat. It was delicious! Most of the ones we had over for dinner that night preferred the taste of that chicken over the others. We were thinking initially that having 3 grills was too much for our backyard. At least one had to go…But, after this experiment, we clearly want to keep all three. Each of them come with benefits. Depending on our mood, the time we have on our hands, we can see ourselves using all three randomly in the future. We loved the chicken on all 3, no doubt about it! What we love about the Big Green Egg and Kamado Style Charcoal ceramic grills in general, is the fun of building the fire, the quietness of operation, the smoke flavors, the heat retention, and versatility. We can sear steaks on it as well as smoke fish quite slowly. What we love about the Louisiana Grill is the ease of operation. Because it is mechanically controlled, you simply set the temperature on the PC Board, and it lights itself automatically and maintains a stable temperature on its own. The smoky flavors are beautiful too. There is also more cooking space, which can be convenient when we have company over. 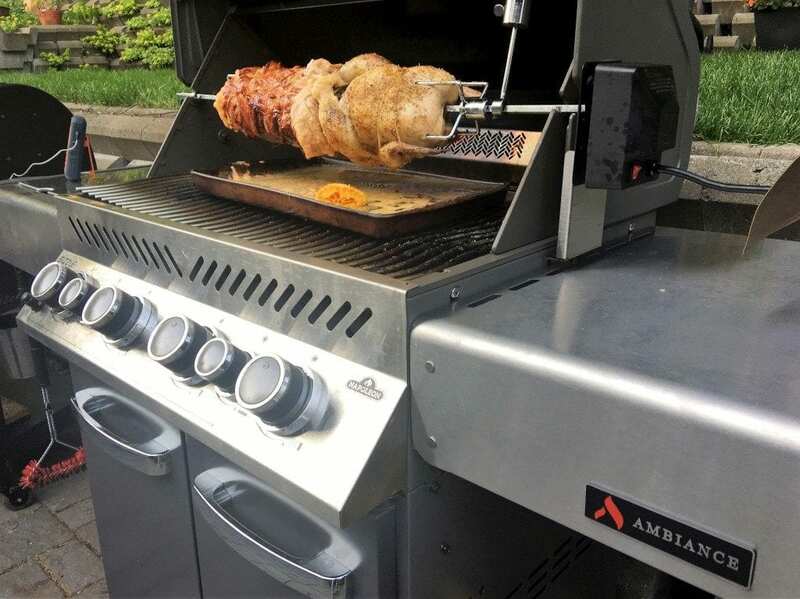 What we love about the Napoleon Ambiance Grill is the rotisserie kit, the infrared side burner and the option of the charcoal tray. We also appreciate the nice-looking charcoal enamel color combined to the fact that it will be easy to maintain over time. It simply looks like a Mercedes! It is also the fastest to get to temperature for cooking. So it gives us a strong grill to use when we are in a hurry. We are planning to cook our own version of a Porchetta on all three grills! We will keep you posted!